During BFF Week we challenged you guys to share photos of you and your best fit friend. The response was fantastic! Just look at these lovely ladies who we picked to win fit goodies! How cute are they?! We love! And to keep the #FBGAntiDiet fun going, today we’re going with a meme that, well, is just everything. Save me, then share me. Sharing is caring! Does the scale have power over you? Does it determine your mood or your confidence level for the day? Do you surrender your happiness to it once, twice or even three times a day? Ladies, it’s time to break up with it! You are more than the number on the scale. Besides the fact that it’s not even the best way to measure your health and progress (we prefer markers like total-body inches, how your clothes fit and how much energy you have), it’s just plain silly to put all of your self worth into one number that can drastically change just because you went out for Mexican last night or because you haven’t pooped today. Seriously. 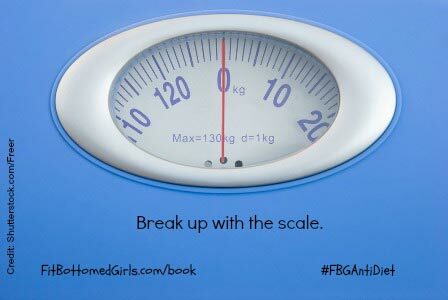 So for this challenge, break up with the scale. Take your power back. And then see if there’s anything else in your life that’s not supporting you or helping you to be your best. Does that extra glass of wine at night make you more likely to hit snooze and miss your morning workout? Do you have more of a devil on your shoulder than an angel when it comes to self-talk? Are you holding back at the gym because you’re scared to try something new or fail? Break up with all that stuff that’s holding you back! Go out. Be brave. Be fit. Be you! You are awesome, just as you are. No special number on the scale required.